In this lesson, we will look into solving equations that have a term with the variable on both sides of the equation. 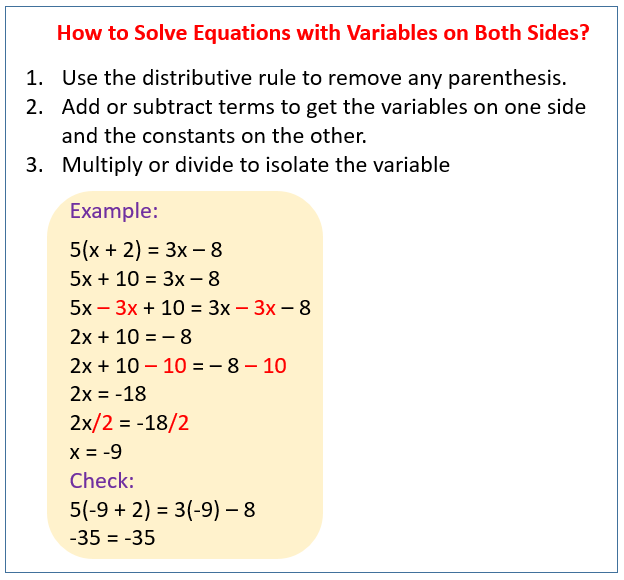 The following figure shows how to solve equations with variables on both sides. Scroll down the page for more examples and solutions. Consider the equation x – 6 = –2x + 3. To isolate the variable, we need to get all the variable terms to one side and the constant terms to the other side. Next, we combine like terms and then isolate the variable by multiplying or dividing. Step 1: Get all the variable terms to one side and the constant terms to the other side. Consider the equation 6x – 4 = 3x + 2. To isolate the variable, we need to get all the variable terms to one side and the constant terms to the other side. Next, we combine like terms and then isolate the variable by multiplying or dividing. How to solve equations with variables on both sides of the equation? Step 1: Add and subtract terms to get the variables on one side and the constants on the other. This requested video looks at solving equations with variables on both sides. It includes four examples. How to use the distributive property to simplify equations with variables on both sides?